Fred Stenson’s book on the craft of fiction has been in print for more than a dozen years and is still a best-selling title for The Banff Centre Press. It is a favoured teaching book for many creative writing mentors. The approach of the book is to be of use to beginning writers but also to delve into craft at a level that will also inform experienced writers. The various chapters on character, structure, style, point of view, and editing draw for illustration and example from five works of short fiction by admired writers Edna Alford, Rachel Wyatt, Diane Schoemperlen, Greg Hollingshead, and one by Stenson himself. 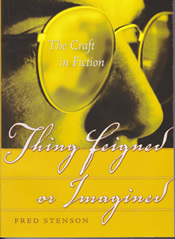 Stenson’s goal in this book was to be practical use to writers; to describe problems and offer up solutions to those problems; to broaden a writer’s sense of the bedrock of craft that fiction writing stands upon.